Enjoy playing Massenet's Meditation from Thais, in the special arrangement for cello and piano by Virtual Sheet Music, accompanied by concert pianist, Lisa Maresch. Thanks to our unique interactive video player, you can easily speed up and slow down the tempo of the piano accompaniment audio/video track, set up loops and markings - all while reading your violin part from the same video. A useful tool for any musician. 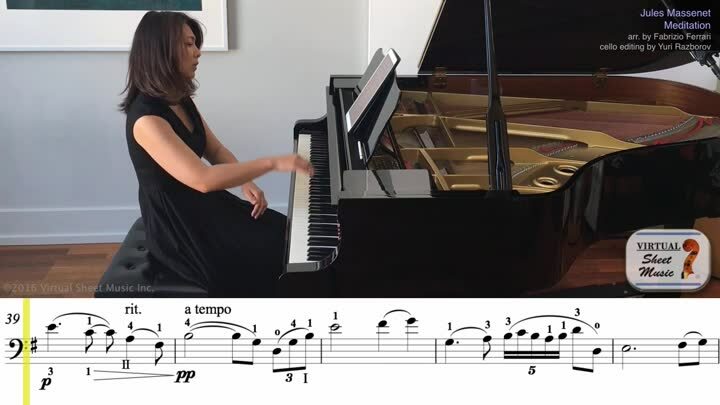 The video includes the premium Virtual Sheet Music edition of the Meditation for cello and piano, arranged and transcribed for cello by Fabrizio Ferrari and edited by Yuri Razborov (cello fingerings included).